Soft and flavorful breadsticks that you pull apart - so fun to eat! In the bowl of a stand mixer fitted with a dough hook (or in a large bowl if mixing and kneading by hand), combine 1½ cups of the flour, yeast, salt, and sugar. Heat the water and olive oil in a small saucepan until steaming. Remove from heat and let sit for 5 minutes, or until temperature is between 120-130°F. Slowly add the water and oil to the dry ingredients, while mixing on low speed. Use a spatula to scrape down the bowl as needed. With the mixer on medium low, add the remaining flour a ¼ cup at a time, mixing until incorporated between each addition. Continue adding flour until the dough clears the bowl and is sticky to the touch without coming off in your hands. Knead with a dough hook or by hand until smooth and elastic, about 5-8 minutes more. Gently push down on the center of the dough to release the gases and knead by hand on a clean surface a few times. Divide dough into 12 pieces and roll each into a rope about 8 inches long. Place on a half sheet pan or inside a 9x13-inch pan that has been greased or lined with parchment paper. Cover with plastic wrap and let rise until doubled, about 30-45 minutes. Preheat oven to 375°F. 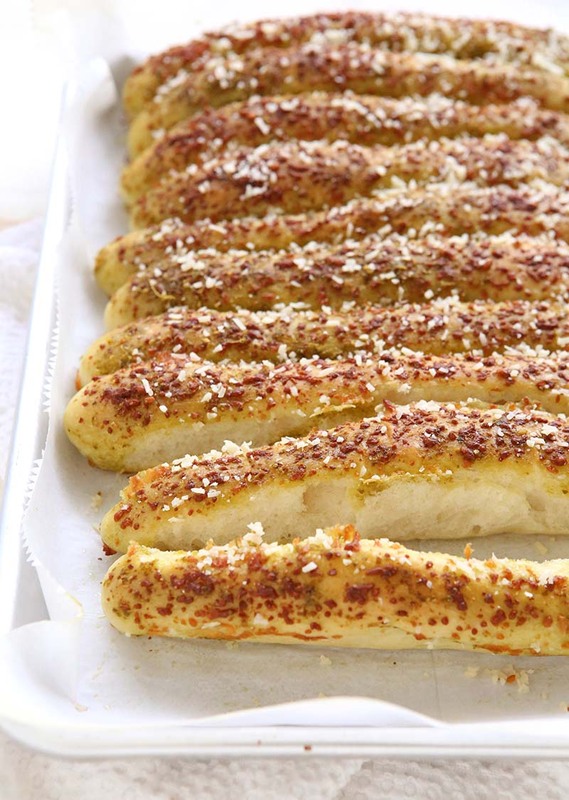 Brush breadsticks with pesto and sprinkle with Parmesan cheese. Bake until golden, about 15 minutes. Let cool briefly before serving with additional pesto, if desired. These breadsticks are best the day they are made, but may be stored at room temperature for up to 3 days.